Cratons (from the Greek "power" or "might") are the areas of the oldest continental crust on Earth, and are preserved only in only a few places around the world. According to scientists, the Kaapvaal Craton in the South Africa and the Pilbara Craton in Australia (the most ancient of these structures) were the parts of Vaalbara, an Archean supercontinent. The transformation of the lower parts of the cratons under the influence of heat emitted by the Earth's mantle may lead to the formation of rocks called granulites that frame cratons like belts. However, the processes that cause granulites to move upward from the lower part of the crust to the surface along the craton borders are still largely debatable. The oldest granulite belts were formed in the Archean (3 Ga years ago), which is only several hundred million years younger than the life on Earth. The youngest granulites are about 0.5 billion years old. One ancient (2.7 Ga) granulite belt is situated at the Kaapvaal Craton at the borders of South Africa, Zimbabwe, and Botswana, not far from the famous Limpopo River. The Limpopo Complex is considered as a natural laboratory for study of relations between the oldest tectonic structures in the continental crust and therefore is of great interest for geologists. "For the first time, we have strong reasons to assume that granite magmas in the Neo-Archean granulite complex of Limpopo (South Africa) have been formed in the course of tectonic interaction of this complex with the rocks of the Kaapvaal Craton as the complex was rising from the lower part of the continental crust," says Oleg Safonov, a co-author of the work, Doctor of Geology and Mineralogy, Professor of the Petrology Department of the Geological Faculty, MSU, and Director of the Korzhinskii Institute of Experimental Mineralogy of the Russian Academy of Sciences. Granulite is a metamorphic rock. It means that it forms in the course of transformation of other rocks under the influence of high temperatures. In the case of granulites, these temperatures are 750 to 1000 °C. Feldspars, quartz, garnet, pyroxenes, cordierite and other minerals are formed under these temperature giving the rock its granular texture. According to one of the models, an important role in the formation of granulites is played by CO2-rich fluids heated to over-critical temperatures. Graphite that is present in metamorphic rocks may help establish whether this model is true. Usually, graphite is formed in the course of modification of organic matter or decomposition of carbonates (salts of carbonic acid with CO32- anion). However, granulites form at deep levels where no organic matter is present, so the graphite formation mechanism is different—graphite is the result of interaction of granulites with mantle flows rich in CO2. Therefore, the presence of graphite in granulites is often considered as an evidence for this model. Its formation depends on pressure, temperature, and other parameters, and the study of graphite can tell a lot about them. 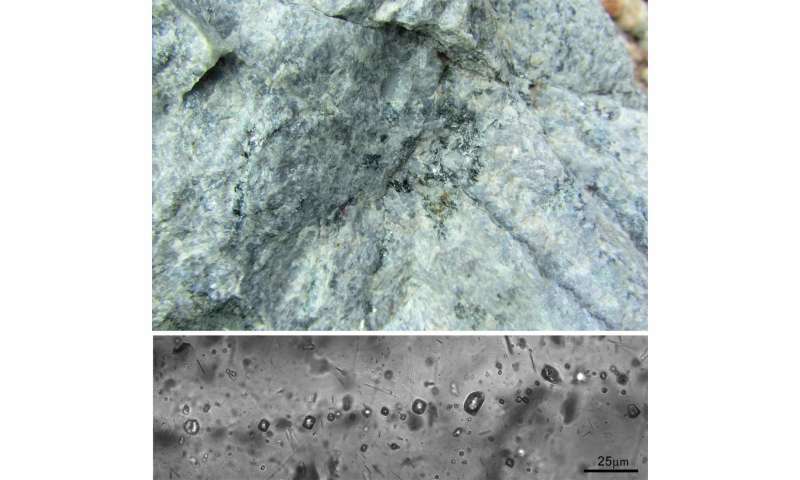 Geologists found graphite samples and fluid inclusions in quartz (volatile components trapped in the small cavities of minerals in the course of crystal growth) in granite rocks of the Limpopo granulite belt and analyzed them. The researchers found that granite rocks intruded the Limpopo granulite belt began to crystallize at the temperature of 900 to 940 °C and the pressure of 7 to 9 kbar. The analysis of fluid inclusions in quartz confirmed that CO2-rich fluids took part in their formation. The deviation of C-13 isotope content from standard values was found to be 6.52 to 8.65 permille (tenth of percent) for graphite and 2.5 to 5.58 permille for the fluids in quartz. This isotopic composition of carbon is usually prescribed to deep fluid flows from the mantle, confirming their external origin once again. This, in turn, coincides with the model of CO2-rich deep external fluids participating in the formation of granulite rocks and accompanying granites. However, having compared this data with the isotopic composition of carbon from the rocks of ancient cratons, the scientists concluded that the fluids migrated through the Limpopo complex from the cratonic rocks in the course of collision with the Kaapvaal Craton. While the study of the rocks in the Limpopo granulite complex was of fundamental nature, the knowledge about the processes of their formation may be used for ore prospecting. "Rocks of ancient cratons are rich sources of various ore components. They are carried by magmas and fluids that originate in the course of transformation of these rocks." comments Oleg Safonov. The data about the formation of the South African granulite complex is also relevant for Russia. The scientists plan to compare their conditions with the data about the formation of granulites in the Lapland belt that is situated between the Karelian Craton and the Inari Craton at the border between Russia and Finland.